Who is Michael Betancourt? For most artists, this is a simple question readily answered by looking at their artwork, but in the case of Betancourt it is complicated by the coexistence of a large, seemingly independent body of historical and theoretical writing that complicates any attempt to answer this question only by looking at his movies and other art. Since the late 1990s, Miami, Florida, has produced a number of artists whose approach to their work deserves serious attention. Betancourt is one of the more intriguing, but lesser-known of these artists. Betancourt was born in the US in 1971 and has been exhibiting a variety of movies, site-specific installations and non-traditional art forms since 1992. He has taken on numerous roles as a documentary photographer, art director and art historian, and claims that he works with experimental art as a way to develop and test theory. He has an interdisciplinary Ph.D. from the University of Miami focusing on the intersection of history, media and art theory, and has repeatedly said that dialogue, criticism and history must be a part of any artist’s working process; the writing that proves he “means it” has been published by such academic journals as Semiotica and CTheory. Betancourt is actively involved with “visual music” and abstract motion pictures. He organized and produced the iota Center’s DVD anthology Visual Music from Iota, and edited a series of anthologies on visual music technologies collecting the designs for “color organs” in Visual Music Instrument Patents, Thomas Wilfred’s Clavilux and Mary Hallock-Greenewalt: the Complete Patents. He is also the founder of cinegraphic.net, a blog focusing on the issues and interests of the experimental/avant-garde film and video community. 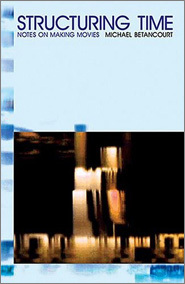 In 2004, a book called Structuring Time: notes on making movies collected his ideas about experimental film into a single volume. And, recently, he has proposed a taxonomic system for abstract forms, published by Leonardo. This system forms the basis for his most recent movies. But Betancourt’s movies and other artworks are not purely academic. His weltanschauung comes from the practice of his movies. 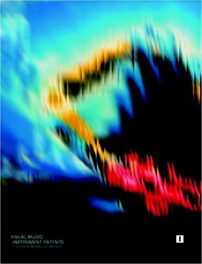 His world outlook is obtained by crossing the bridge between the empirical nebulas of experimentation to push current boundaries in the visual form through movies that experiment with a proposition on breaking up space, giving new results to his theoretical work as he presents a unique audio-visual experience of simultaneous unity. I interviewed Betancourt after seeing his latest work, Eigen: the theory of self-generation (2006). REY PARLA: Some artists are “drawn” to their art. Was this true for you? Can you tell us about how you got started with making videos? MICHAEL BETANCOURT: I wanted to make movies, which is what I’m doing. Along the way, I’ve done things with photography and painting, too. But the first movie-like things I did were with programming in BASIC on the Apple computers: animating text to move around the screen, graphics that would move based on user-defined parameters. This was all in the late 1970s and early 1980s. Nobody saw this stuff – I was just a “dumb kid” – but it was where I started. My early movies all had some aspect of this work. I recently started looking at some of these old computer things I was doing years ago and have been thinking about how to incorporate some of them into my movies. Do you remember the moment when you realized that you wanted to be a media theorist/artist, over any other profession? Please tell us how you became aware of your ambition. It was less of a choice than just the way things developed. From the beginnings of my working with media, I was thinking in a consciously theoretical manner, a matter of trying things and then revising my thinking. The Russian montage theorists’ approach – quasi-scientific – was a useful model for how I went about learning things with media. The transition to writing followed naturally, growing out of my note-taking. Most of my work happens in notes and very schematic diagrams that get revised into gradually more specific and detailed things. All of my theoretical writing started with that kind of thing. This is why it’s hard for me to separate making things from my theory work. The label “artist” got stuck on me by others and, like a lot of labels that people use, it’s stuck even though it isn’t a good description. The same can be said about “theorist” I guess. My interest is mostly in the process of creating and implementing frameworks that determine work, which is why I prefer to identify my movies as “designed”. Is there one particular event in art history that has influenced your work? Not really. I look at a wide variety of things, some art-historical, some scientific, so identifying any in particular as “important influences” isn’t something that I would do. Can you define your style? There are a lot of people working with abstract video, but I haven’t seen anyone making videos that resemble yours. Would you explain how you have developed it to its current, very unique status? I don’t really feel like I have a “style” per se. There are some formal things that run through most of my recent work, mainly the heavy digital processing of color and break-down of my screen into smaller units. But I don’t know if that qualifies as a style since my most recent work does none of these things, and works with a color palette that can be murky in places. And my recent looping pieces [such as Eigengeistige] are more like static imagery in their cumulative effect than a movie. Then, where do you place your work: under experimental cinema, video art, visual music, new media art, avant-garde video/cinema or just movies? These are certainly all historical contexts that have a relationship to my work. I would relate what I do to painting, as opposed to photography, rather than any of these particular niches. The so-called “experimental film” is a history-tradition of great importance, but most of what I do tries to exceed the established, historical boundaries of these histories. Whether the work does or not is a different issue. With the frameworks I produce for a work/group of works, they always originate with these histories. Meta-historical would be a good word for their relationship. Do you see your work as part of a larger group of artists? I think there are other people who are working with some of the same things I am, but my experience with “groups of artists” would make me say, “No.” The art market demands that artists be unique, individual, and so works against the collectivity your question implies. So does an American Avant-Garde exist now? Does it go by another label or title? I have no idea. Judging by what I see other people doing and what gets shown, I’m severely “out-of-step” with what’s happening now. So, instead of answering, I’ll just say you should ask someone else. Okay. Well, how do you define art, and have recognition and awards had an effect on your career? I try not to define “art”. Recognition and awards are especially important when you’re not trying to make objects for sale in a gallery-type setting. These allow you to continue working, but more important, they serve the same function as the gallery/museum: they are tokens that lend credibility to the work for people who don’t understand what’s happening with it, or whose definition of “art” is otherwise in conflict with the kind of things that I do. I think of them as enablers that open up possibilities. Over the spring of 2006, I had an Iowa Arts Council/NEA grant to do a microwatt broadcast-video piece based on Telemetry [2003-5] called Reception/Transmission that extended some of the ideas in Telemetry and provided a nice conclusion to that group of works. It would have been hard to do the Reception/Transmission piece without the grant support. Do you think video is exclusively a contemporary art form just based on technology or can we take it back to painting and the Renaissance? I’m guessing you mean the framework in Structuring Time. I would say it’s extendable into the past, and out into non-technological media like painting. This is the part of this framework that I find the most interesting: by focusing not on technology, but on human visual interpretative engagement (cognition), we have to rethink our ideas about medium-specificity and what makes “different” media “different” – especially when we’re confronted by the ambiguity inherent in digital objects where the implementing software is what makes the difference between a sound file and a movie or text document. Do you consider yourself a painter? Not many artists write about their work as much as you have. In looking at your writing, most of it isn’t directly about your own work. So, why write Structuring Time? My book on movie-making, Structuring Time, was a way of getting my own ideas to solidify somewhat, while also putting them out into the world as a coherent system. But it’s a descriptive system based on empirical observations, not a prescriptive one. Up to this point, much of that book was a jumble of disjointed fragments, and the collecting and fitting into a whole was very useful. If anything, it accelerated my organization of notes into something more coherent. Having the book has been useful in other ways since it gets the theoretical aspects of the movies into an accessible form. So do all your experimental videos aim to test your theories? You could also say all my theories test my experiments. There’s no clear distinction between one and the other. This isn’t a question that means anything in my working process; there isn’t a distinction between one and the other. So, you have a conscious system in mind before you start to design your work? Yes. The conscious system is what makes the work; it functions like a “script” would for a drama. Do you mean to say drama as we know it is only understood through character and story? Drama demands “characters” and a narrative of some sort. It’s possible to expand this general framework to be very inclusive – Mary Ellen Bute has a film, Escape that is fully abstract, yet also a fully narrative and dramatic work – but in general these are thought of as separate things from what I do. But I’m not certain I would make that distinction. In the intro of Structuring Time, you talk about artistic repetition. Do you use these “conscious systems” as a way to avoid repeating yourself? Are experimental filmmakers known to repeat the same movie as narrative film directors have been known to do? That’s not how I meant that opening section. Repeating essentially the same piece over and over again isn’t very interesting. The range of what can be done gets exhausted very quickly, but at the same time is essential for commercialisation. I know that it is something I was never interested in doing: establishing some sort of “personal style” or “signature” that would then define anything and everything as being “mine” in the sense we speak of when we talk about the auteur theory. These personal “styles” work in the same way that the different frameworks do. They establish boundaries and limits that allow us to make work. Since I’m much more interested in how these frameworks produce the work than with establishing a singular method for producing works – that is, my interest lies elsewhere than in producing objects for sale – my approach seeks to avoid repetition. I’m sure I fail in this … how could I not? Does your work grow organically one from the other? For my working process, this doesn’t make any sense. There is only a limited distinction between any single work and any work from a specific group of prices. You’ve referred to your movies as only half the equation and implied that the other half is your theoretical writing that emerges from practice. Are you creating a kind of hyper-textual visual poem alluding to literary poetry and its imbedded classical allusions? Are the movies meant to be seen again after the reading of your writings? Is this hyper-visual music-text available on the web, a perpetual timeless project? No, I say that my writing is the “other half” of my work. There is no clear distinction between one and the other. I don’t see my stuff as having any grandiose claims about what it is. A lot of it is funny and doesn’t try to be more than an exploration of the ideas it’s engaging with. My theory work divides pretty readily into a series of general propositions about media work based on an empirical observation of the materials that constitute movies (whose foundations derive from cognitive approaches to visual interpretations), and based in this empirical framework are the particular sets of choices that determine a specific group of works. Most of the theory tries to be non-specifically tied to my own stuff. It could be used by anyone who wanted to use it. Your process sounds very scientific, rather than “inspirational”, and your theoretical writings have this same scientific quality. Does science play a role in your movies as well? Since I work with technology to produce my movies, to distribute them and to show them, science is just there, a background part of it all. At the same time, there is a lot of scientific work – especially in the realm of cognition – that finds its way into the theory; that’s inevitable. Once the theory stops being grounded in a personal claim of “I intended x,” then it moves away from the idiosyncratic. At that point, the question is simply whether the “science” is based in contemporary work or is just a reiteration of popular “notions” that may be discredited, or otherwise rejected. For my own work, I try not to advance new scientific thinking, but instead look for ways that cognitive theory converges on things in the arts. There’s a very real tendency for different disciplines to re-invent the same ideas, giving them discrete terms and focusing on different aspects of what may be the same underlying phenomenon. That part is of interest. You are also the new curator at the Sioux City Art Center. Does working theoretically as you do impact how you approach the research and selection for the projects you have curated? Working as a curator is different than making my own work. It’s much too easy to say my ideas are X and anything that doesn’t meet X is thus of no interest, or “bad” or whatever. This is an extremely authoritarian position to take, dictatorial, and does a disservice to the people whose works you’re handling. When thinking an idea through, it’s easy to “see” that idea everywhere, even if it isn’t really there. So, when curating I try to look first for the work that seems well-done – about something, not directly an imitation of some well-known artist, that uses its media effectively to convey itself, etc. – and only after that do I think about how work by different artists could go together; an entirely different approach. Do you see the people who are filmmakers, experimental artists, painters, writers, sculptors, graphic designers and others intermixing much in today’s scene? I think this depends on where you’re located. What seems like a “natural” connection to people living in one location may seem utterly foreign to people living somewhere else. We live in a world with plenty of marginal areas that are so distant from the main thrust of the commercial art world that they aren’t even “on the map” for it. This isn’t a criticism. The world is a very large place and the art world is clustered in only a few small parts of it – mostly around money and political power – but there remains this much larger space that has little or no contact with these places. To some extent, the internet has helped change that, but, as it has “matured”, I’m seeing more of these older structures being transferred into it. The extreme openness that was there from say 1995-2000 won’t be imaginable 30 years from now when the relationship between the “new media” and the established institutions has been completely worked out. There’s a whole rhetoric of there no longer being marginal positions in relation to the art world, and that’s simply nonsense. Yes, the art market has a global reach – it’s globalised – and there isn’t any difference between Tokyo, New York and London or Berlin, and artists who are inside this market can move freely between one and another. This is true, but what about the rest of the world? What about the artist living in Belize or Sri Lanka? They don’t have access unless they move. So, there are still margins, even if the art market/world doesn’t want to see them or admit their existence. What can be done and is being done depends greatly on where one lives. What is the state of video art these days? It’s history. If the history is just a series of ruptures with past artists –1980s vs 1970s, or 1990s vs 1980s – then the shift away from “video” per se and into installation where video is simply a part of a much larger, more marketable, whole shouldn’t be a surprise; it was happening in the early 1970s and has more or less been the “default” mode for video art. On the other hand, if “video art” is a subset of so-called “experimental film”, the prominence of installation is very foreign to it and the arguments about installation being “more democratic” – same argument made historically in film about long-take æsthetics – is nonsense. This second view would also suggest that those artists who have chosen to use and/or hire commercial production methods in a Hollywood-style should be viewed suspiciously, and analysed from within the dominant ‘Hollywood language’. There are lots of people doing this, so to single anyone out isn’t really fair. This work is recognizable as violating and fighting against the critical positions historically associated with “video art” – a development that, if true, would be cause for concern. When I think of your work, I think of long abstract movies, like Telemetry or Prima Materia  that don’t seem to have a basis in photography. Are your movies camera-less productions? Some are, some aren’t. It depends on what the piece is. Which works have you used a film camera with whether it was Super 8 or 16mm? I don’t think whether something was shot with film or video, made with a computer or hand-drawn makes any difference. Certainly you can do things more readily in one form than another, and there are technical differences between them, but in the end it’s what the finished work looks like, and what it means that matters, not the media used. What tools do you use to make your videos? Do you use custom software, or commercial packages like Final Cut Pro? I can say what I have used in the past. I’ve worked with feedback, various pieces of software such as Final Cut Pro or Adobe Premiere, analogue editing, 16mm film, rephotography of both video and film, “direct” on film animation with markers. All of this gets chosen based on what is appropriate to the framework I’m using for the work, since, when the framework changes, the work consequently changes as well. Most of what I’m doing now is digital, and I’ve started doing some things with Flash, but thus far not much. So, you use optical and audio feedback in your work? Yes, or, I should say, I did in the past. My more recent works employ forms and structures that resemble these forms, but aren’t technically the same. It’s very difficult to control the results with feedback and it can be very time-consuming to work with it. So, I prefer to create similar effects, but in ways where I have more time and ability to control the parameters of the result. I guess you could say I simulate the underlying processes of feedback, thus creating the same visual/auditory effects, but without actually using feedback per se. What do you see happening with media integration? Are video artists, media-makers at the forefront of new developments, æsthetics and techniques like the early pioneering filmmakers and American avant-garde experimentalist? What is “media integration” but the gradual realization that the media don’t matter, that it’s what is done with the media that is important? I’m not seeing new developments happening much anywhere. Refinement, yes. Improvement and increased ease of use, definitely. But new? No, I’m not seeing that so much. But then we’re living in a period when there’s not much interest in new. What we have instead is the iteration – an artist looks at the past and chooses some small aspect that wasn’t fully developed—in a formal sense to exhaust all its potentials – and then makes that the primary focus of their work. This doesn’t mean the work is bad, just that it isn’t new. Rachel Whiteread’s casts of spaces is a great example of this. Her work is really good, but it’s also implicit in Bruce Nauman’s cast of the space under his chair, so we’ve seen what she’s doing before in a general, conceptual sense, but her handling of it is very different and on a much larger scale. And the resulting works are good, but, at the same time, there’s nothing new to them: their seriality, the underlying concept, and even some of the larger scale pieces like the cast house aren’t new developments in the sense you’re asking about. This doesn’t mean that there aren’t artists who are working in these directions, doing this new stuff, simply that we’re living in a period where those artists aren’t generally going to get the kind of attention they might have in the past. You have edited several anthologies on visual music and written about its history. One of your essays talks about synæsthesia. You also created a “taxonomy for abstraction” with synæsthesia as your starting point. 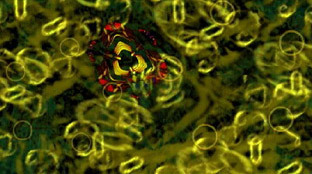 Can you tell us a little about synæsthesia and its relationship with visual music? In a lot of ways, I think that synæsthesia in art is the reaction to/rejection of science by artists; a way of trying to critique the empirical approach with the personal and idiosyncratic. VJing or visual music is one of the things that emerge from this historical moment. The relationship is very complex. Visual music is an obscure field, yet you are something of an expert in its history, not just on film but with color organs, too. How and what led you to become interested in color organs? Were you familiar with Daniel Vladimir Baranoff-Rossiné, Charles Dockum, Stanton Macdonald-Wright or Thomas Wilfred at the time? My interest started when I was an undergrad and read an interview with Brian Eno who talked about them. It struck me as an example of how anything could be subjected to æsthetic manipulation. Have you always worked from computers/programming to arrive at visual music experiments? Not everything I do or have done qualifies in my mind as “visual music” type work, so I don’t really know how to answer this. Computers are simply a tool, like a camera or a pencil. The point is what gets made, not the mechanical aspects of making it. Then how does your interest in chaos theory inform or influence the visual and musical aspects of your work? It is less an interest in chaos theory than an interest in specific structures and forms derived from the study of fractals themselves. The most important of these ideas for my approach is “recursive symmetry”. It’s a complex way of describing the repeating self-similar nature of fractals. It scales. But what is of greatest interest is the way very complex forms can be produced from very simple, limited sets of “rules” or conventions. It’s this aspect that emerges in my work and is the reason it’s difficult to separate the theoretical construction from its implementation. This dynamic relationship is what I think of as the intellectual process and/or visceral result. Can you share some thoughts on the VJ culture? Where does the line break between wallpaper and art? I think it could, but generally won’t. This distinction, wallpaper/art, is really a distinction in use of the work by its audience rather than something inherent to the work itself. Like everything, there are VJs who are better than others – as with any work that depends on live performance – but if their audience treats their work as wallpaper – that is, as a decorative supplement to their experience of something else such as the “club” – then that’s all it is. I don’t. What happens is I’ll be interested in something musical and listen to a lot of work in that vein, then find myself interested in something else and go listen to that for a while. There isn’t a single sort that really holds my interest for very long. Right now, there’s a group that’s “performing” the music written for video games on the Commodore 64 computer called the “C64 Orchestra”. The great variety to this music, even the difference between different composers, is very striking given the extreme limitations of what a C64 computer was capable of doing. You also work with public art and installations. I remember the projection piece you did in Lummus Park during Art Basel Miami Beach that seems very different from your work with video. Is this work all related, or do you treat different media as completely different things? Everything I’m doing is connected, even if the connections aren’t apparent from the outside. My work with what can be called “site-specific” art, or “public art” or something like that, this stuff isn’t movies, but relates to the same ideas although in very different ways than the movies do. All of it involves adopting the form of authoritative instructions – signs, barricade tape, etc. – whole roles are unquestioned and “transparent” to our everyday use of them. And this work uses those forms as a way of undoing their transparency. It’s the same process as the movies’ relations to their history, but enacted in different materials. Spook, the Lummus Park projection, falls in-between these since it was an image, but whose installation – through the associations of racism – can evoke issues of authority and force us to confront them – or not, depending on whether we realize what we’re looking at with it. Your installations and video work are very different in form. Do you have a favourite medium and does it influence your creativity? I don’t really think that the media I use influence my “creativity” since everything important to a work happens before I start on it. There’s plenty of room for accident and chance in my process, but, because I use technical media whose manipulation depends on how the technology is implemented, planning before hand is essential to making anything happen. What do you aspire to as an artist? As an “artist” I really don’t aspire to much but to make work, to show it occasionally to people who are interested. Just to be able to continue working and showing work sounds like a very low-level aspiration, but I’m doing this on my terms, not inside a gallery or with the authorization of that market-system. So, in a way, this isn’t a minor aspiration at all, to remain outside and able to work without the need for the market. Which challenges do you confront as an artist? I think it’s the same challenges everyone who doesn’t make things for a gallery market and isn’t trying to get into that market: making work and then finding ways to show it. Once you exclude the market-based aspiration, you also lose a large volume of places to show work, so showing things becomes problematic. So, do you create with a specific audience in mind? Who are they and how are they reacting to your work? My audience is Leah [Betancourt’s wife]. Anyone else who likes my things is good, too. What other interests do you have besides art? There’s other stuff than art? I thought everything people did was art. I have a bunch of butterflies, bees and squirrels in my yard and their activities are very interesting. How they interact, their territoriality, etc., can be quite compelling. Watching them gives a sense of how the natural world was compelling for ancient peoples. 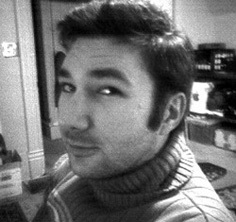 Michael Betancourt’s work can be found on www.michaelbetancourt.com and on the avant-garde and experimental film blog cinegraphic.net.